Whilst doing some research on Satô Chinkyû (佐藤珍久), I found three tsuba of him with the same sujet of which two are almost identically interpreted. First of all, his name is often also read as „Yoshihisa“ and not much is known about his life and career. We do know that his civilian name was „Satô Yagobei“ (佐藤弥五兵衛). His father was, according to transmission, a certain Shôami Shirô´emon (正阿弥四郎右衛門) who was supposedly active around Kanbun (寛文, 1661-1673) but of whom nothing is known except this connection to Chinkyû. Well, the date Kanbun might be dismissed for the following two reasons: Chinkyû studied later in Edo under Nara Toshiharu (奈良利治). His year of death is unknown but due to an extant work with the signature „gyônen nanajûissai“ (行年 七十一歳, „at the age of 71“) and the date „Kanbun-san koyomi-rokugatsu“ (寛文三暦六月, „sixth month of the third year of “), we can calculate his year of birth to Bunroku two (文禄, 1593). There exists a further work which is signed with the information „at the age of 85“, that means Toshiharu was active at least until around 1678, i.e. until the second half of the Enpô era (延宝, 1673-1681). And Chinkyû´s famous student and son-in-law Tsuchiya Yasuchika (土屋安親) was born in Kanbun ten (1670). So if Chinkyû was the son of Shôami Shirô´emon, the latter was surely not active around Kanbun as otherwise his son would not have been able to get in touch with Nara Toshiharu and would have been too young to be the master and father-in-law of Yasuchika. 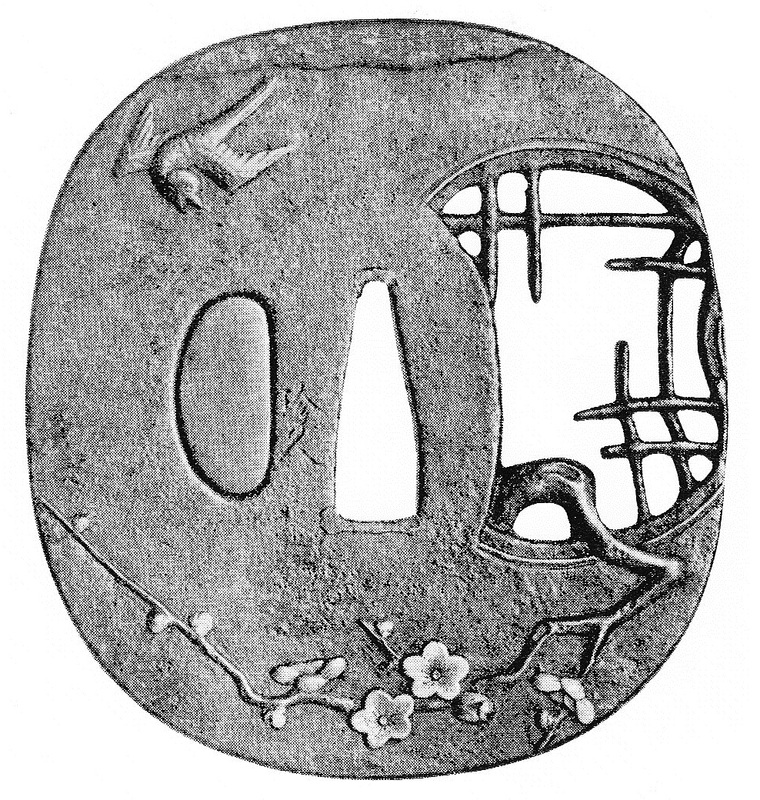 Picture 1: Nara-style tsuba of Chinkyû, spring scenery, signed „Chinkyû“, iron, nadekaku-gata, takabori-iroe, sukashi, one hitsu-ana (plugged). Anyway, Chinkyû brought the Nara style to his home of Shônai (庄内) in Dewa province and is therefore regarded as the founder of the Shônai branch of the Nara school. That means his works are of course strongly Nara-influenced what concerns first and foremost those from his earlier period which are done in iron. A good example from this artistic period can be seen in picture 1. 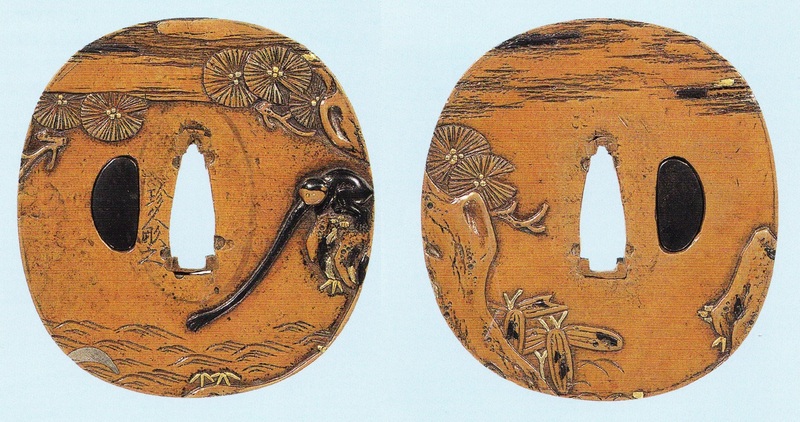 But the two very similar tsuba I mentioned before (pictures 2 and 3) were probably made even before his studies in Edo as they show pretty good the Shôami influence of his supposed father. Both show on the right side of the omote a so-called „kenbyô“ (硯屏), a decorative small table screen which protects the writing area from dust and the like. On the left side we see ink and on the ura a brush and an inkstone. 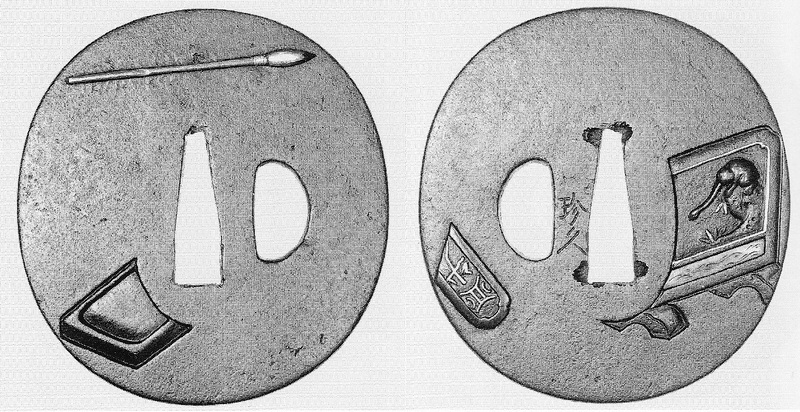 That means writing utensils (bunbôgu, 文房具) or calligraphy in general are the motif of the tsuba. The interpretation is tasteful and the workmanship surely of a certain quality but most interesting is the monkey depicted on the table screen. It sits on a small rock with some grass highlighted in gold and stretches his rather long arm out to the left, the area of the screen which is not seen because of the seppa-dai. 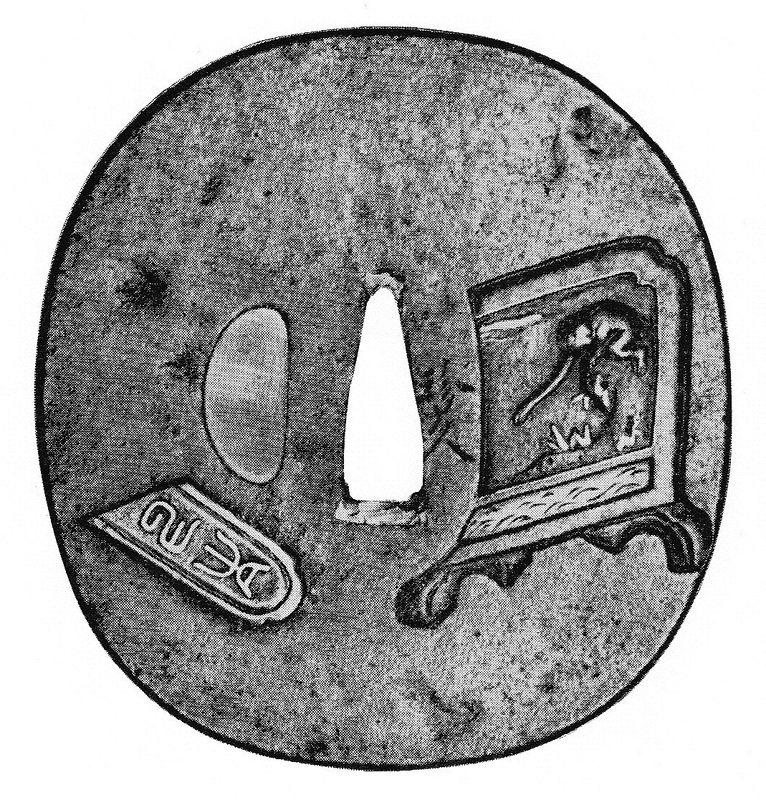 The same monkey in the very same posture (also with the rock and the gilded grass) is namely seen on Chinkyû´s most famous tsuba (picture 4), the suaka-tsuba with the so-called „enkô-hogetsu“ motif (猿猴捕月). The term „enkô-hogetsu“ derives from an Buddhist parable where a monkey tries to catch the reflection of the moon in the water. The picture stands for the useless attempt of striving after goals which are beyond the limits of oneself or the human nature in general as the limit of the monkey´s smartness is to realize that there is nothing in the water he can catch even if it is shining. The name of the sujet is also quoted in slightly different formulations like „enkô-sokugetsu“ (猿猴捉月), „enkô shugetsu“ (猿猴取月) or just „enkô ga tsuki“ (猿猴が月), where „enkô“ means „monkey“ and „ho/torae(ru)“ (捕), „soku/torae(ru)“ (捉) and „shu/to(ru)“ (取) „to grasp, to catch“. The style of Chinkyû´s enkô-hogetsu tsuba anticipates what is later one of the most representative styles of his master-student Yasuchika. That means the shape of the monkey, the obviously too large pine needles and bamboo grass bushes on the ura play with a pretended „amateurishness“ but are of course perfectly executed. Also very subtle is the contrast between the black shakudô monkey to the right and the deliberately applied shakudô plug of the hitsu-ana to the left. The moon is found on the very left bottom of the omote and please note also the delicate sukinokoshi-mimi at the bottom right area which is a continuation of the rock on which the monkey sits. That means with this and the small gilded bamboo grass elements, the artist obviously tried to make the monkey not appear as if he is sitting somewhere on a high cliff which would make his attempt of „catching the moon“ innately impossible. Thus this small detail also shows the attentiveness of Chinkyû regarding the effect and impression of his motif. There is also a different approach to this motif where the monkey hangs down from a branch with one hand trying to catch with the other one the moon in the water which is depicted more or less directly beneath him. Picture 5: Detail of all three monkeys.